It was my up-for-anything friend David that came up with Day 328's thing I've never done before. He's a crazy talented graphic designer and into artsy things. He suggested we take a glassblowing class. The only thing that I knew about glass blowing at that time was that my high school friend Will had quit his job when he was in his twenties to give a serious go at making a living being a glass blower. I thought it sounded cool, but his family thought he was nuts. "They have that here?," I asked, completely forgetting that Atlanta is a big city with a lot of creative people. 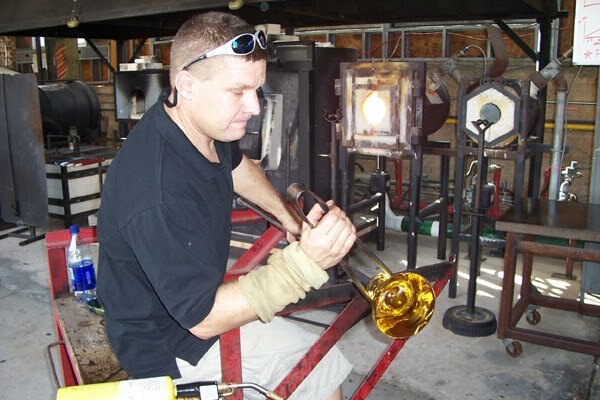 Of course Atlanta has glassblowing! Of course it does! David explained that there was a glassbl owing studio near both of our neighborhoods. They teach day-long classes on the weekends and just so happened to be offering one that Saturday, Day 328. Day 328's thing I've never done before was to blow glass. Or glass blow? So we signed up, and after meeting for lunch at Albert's, we headed over to Janke Studios for our class. We had a little trouble finding the place. Partly because neither of us knew where we were going, and also because I had no idea what a glassblowing studio really looked like so I had no idea what to look for. Janke is tucked inside Studioplex, a relatively new industrial looking office/apartment complex in historic Old Fourth Ward. 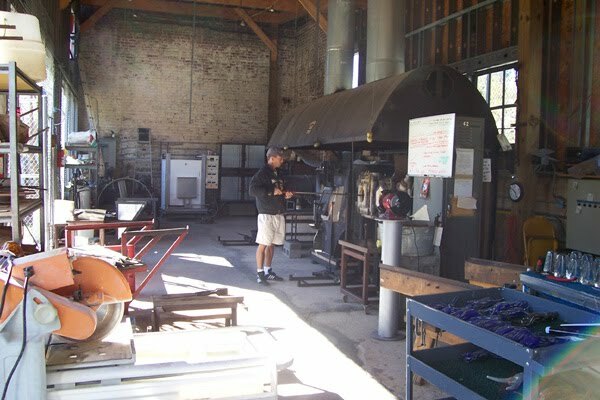 Even after we parked the car and were walking over to what we thought was the glassblowing studio, I wasn't positive that we'd arrived at the right place. Not until we felt a punch of heat coming from an open warehouse-looking room full of ovens full of melted glass, was I sure that this was it. I instantly regretted taking this class in August, as the website suggested, as a safety precaution, wearing closed-toed shoes and long pants. The entrance to the studio was about the size of a garage door and opened to a grassy courtyard. David and I stood next to a middle-aged man who was almost pacing he was so excited to be there. He was wearing "dad" jeans and told us his family had purchased this class for him as a Father's Day present. I could tell that he was fighting the urge to jump in there and get started. I thought about my own Dad and all of the Father's Day gifts I'd boug ht him over the years. I've definitely let him down in the past, but I'm quite certain nothing would've let him down as much as a glassblowing class. I admit, what he was watching was pretty mesmerizing. Inside the studio, which was dusty and hot, we saw an older gentleman working on a glass project. He moved quickly and purposefully heating and then shaping a blob of glass into what looked liked candlestick holders. He made it look easy, but I'd gone on enough adventures to know that when professionals make something look easy, it's usually not. I prepared myself for the worst. I also noticed that glassblowing, at least the kind this guy was doing, was not an individual craft. While he seemed quite capable, the kind of project he was working on required another set of hands, provided by a younger gentleman. The two worked together, transferring the glassware from one long steel pipe to the next. Their movements were so smooth, it was almost as if they were doing a well-choreographed dance. The younger guy, Alex, turned out to be our teacher. He was cool, and attractive in a, "I make things with my hands, I'm an artist," kind of way. He gave each of a us a stack of papers stapled together that included an outline for the class, a long list of general terms and a list of class policies. The worksheets seemed like a lot to deal with for a day-long class, but I skimmed over all of them and waited for further instruction. Alex gave us an overview of what we were going to be doing by taking us step-by-step through all of the equipment; as he was explaining it, he demonstrated himself, and ended up making one of the pieces that we would first attempt. The guys elected that I go first, so with teacher by my side, I walked over to the furnace to gather my glass. Gathering glass happens as you might think it does, by merely dipping a stainless steel tube called a, "blowpipe," into a furnace filled with molten glass. A few turns was all I really needed, but the heat is so intense, the very first step was not an easy one. And I thought that I was strong, but I had difficulty getting the leverage I needed to pull the pipe, now dripping with molten glass, out of the furnace. Luckily Alex never left my side and was there to pick up the slack. Once the glass is gathered, Alex instructed us to keep the blowpipe in constant motion as we moved from one station to the next. Because, like melted caramel might fall off a Popsicle stick when held still in one place for too long, that's exactly what happens to the glass. I had to continually turn the blowpipe to keep the molten glass from falling off the end. But like walking and chewing gum at the same time, easier said than done. The second step in a glass project after gathering the glass in the furnace is coloring the glass. Before even starting, we sifted through bags and bags of shaved glass to chose the right color and then we'd dump the appropriate amount onto a table. 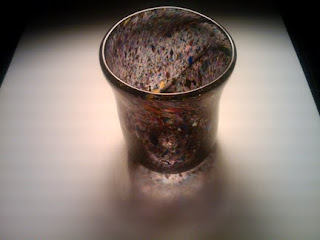 After walking from the furnace, we'd pause for a minute or so to let the glass cool slightly, and then we'd walk over to the table with the colored glass and lay the blob in the shards of glass, smashing the color to our creation, we had to turn around and put the stick into an oven to heat it, and melt the color in. Once reheated, we sat on a bench, still turning the stick in front of us, we'd take giant steel tweezers and pull the melted glass away from the blowpipe to form petals like a flower. At least that's what was supposed to happen. I simply couldn't work fast enough. I learned quickly that time is of the essence when it comes to to working with glass. That's because glass cools quickly and its consistency becomes less like caramel, more like thick tar. 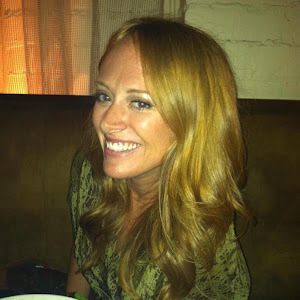 And since I don't work well under pressure when it comes to artistic projects, I was a nervous wreck. Within seconds, shaping the petals with the steel tweezers was like a full-on upper body work out and it did not end well. My flower ended up looking like a crippled hand that got stuck in a paper shredder. Super Dad and David followed me on making flowers, and I think both were surprised that it wasn't my girly lack of strength that made the tweezer work difficult. The glass was seemingly hard for them to shape as well. The next project we worked on was a paperweight. I made plenty of paperweights in elementary school art class with clay, but this was going to be a serious, high-end paperweight. I was already thinking about who I was going to give it to. Definitely the person in my life who does a lot of paper work next to open windows. 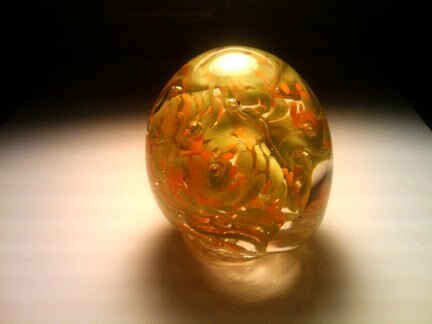 A paperweight is actually two projects in one. We dipped our sticks in the melted glass, chose a color, reheated and sat at the work bench, just as we'd done with the flower. Only this time, instead of pulling the glass to form petals, Alex let us be creative and told us to do whatever we wanted. We could pull the glass, poke holes in the glass, make indentations or twist the glass. This was a little bit more free form, because whatever we did here was going to create the optical illusion inside the paperweight. Once we were done adding all of the visual effects, we returned to the furnace for more glass, covering the free form blob with another layer of clear glass that we helped smooth into a nice, round, smooth dome. This project got a little tricky at the end because in order to give the paperweight a flat bottom that makes it functional, we had to use diamond shears, or oversized steel scissors to create an indentation at the base. Like pulling cooled glass with tweezers, a physically exhausting task. I did it though, and once completed, Alex took a hammer-like tool and knocked the paperweight off of the stick to continue cooling. Though I have absolutely no use for a paperweight, this was probably the project that I am most proud of, just because it looks cool. There were a few nicks and minor burns here and there, but we made it to the end of class without any serious injuries. And we were mighty impressed with our flowers and paperweights, but couldn't ignore the fact that we hadn't yet blown any glass. We'd melted a lot of glass, shaped a lot of gla ss and created a couple glass items that I knew had absolutely no purpose and would simply clutter my house. The final challenge was to make a tumbler that would require us to, for the first time, actually blow air through the blowpipe into the melted glass to hollow it out and created the "cup." If reading the words, "blowing into a long stick," make you chuckle a little bit, then congratulations on having a dirty mind like David's and mine. We could hardly contain ourselves when our middle-aged super excited dad classmate literally asked a dozen questions all including the word, "blow," and all completely relevant, yet dirty-sounding. So we just put our mouth on the end of the blowpipe? And then we just blow? How long should we blow for? And we need to hold the stick while we are blowing? I realize there is really no easy way to talk about glass blowing without saying, "blow," but I couldn't help but be embarrassed. 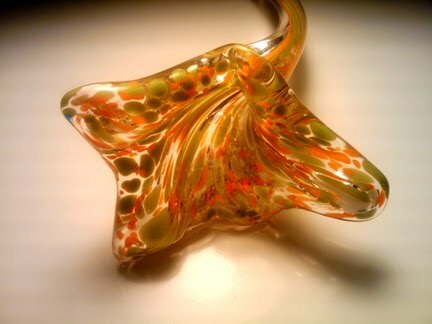 I soon found out that hearing my dorky classmate say "blow," at least a dozen times would be the least of my worries, because "just blowing" glass was not "just" anything. Glassblowing is hard work. It felt impossible. I was blowing all of the air in my lungs out, but nothing seemed to be happening. There was a moment when I thought, thanks to the heat, that I might pass out right there on the cement. My face turned a million shades of red and my cheeks began to shake as I looked at Alex, a pleading look of desperation in my eyes. I have never been so relieved to hear him say, "That's enough," in my life, this time indicating that I could stop blowing. After I was done, I walked the now hollowed glass back to the oven for more heat, and then just like I saw him do with the older gentleman at the beginning of class, we transferred the glass from one blowpipe to the other so that I could work with the opened end. The opening is only about the size of a quarter, however, so with great finesse, I had to reheat the cup and then using the tweezers, slowly make the hole larger while constantly turning the cup. I thought I would destroy the glass, but I actually did it, and did it quite well. My tumbler is more of a juice glass, but the fact that I can drink out of it is quite remarkable if you ask me. If I've bored or confused you with all of these terms and instructions on how to blow glass, then you understand how truly difficult this craft really is. And I'm sorry that I don't even have super cool pictures to show you what it looked like because of the whole lost my camera in New York thing. Trust me, I'm more disgusted by it than you are. As suspected, my two sad flowers and paperweights are collecting dust on a book shelf in my living room, but the glass will make another appearance on the blog, so just wait for that. This class was a pretty cool and interesting way to spend a Saturday afternoon, but I think I'm going to leave the real glassblowing to the professionals. I do know that my days of scoffing at high prices for hand blown glass are definitely over. I know the blood, sweat and elbow grease to create the intricate, colorful pieces and trust me, they are worth every penny. This sounds really cool - but then I went to the website and it is really expensive too. Can't wait to see pics of your actual items. Those three pictures are actually my pieces, believe it or not! David was nice enough to take pics of them. You Thought I Quit Didn't You?